In July of 2014 I passed through Ouray, Colorado on my see-the-USA-in-an-RV trip. I’d come to the mountains of Colorado to see and photograph the sensational scenery as well as to get away from the often oppressive heat of southern Utah which is common during the warmer months. My last significant destination in Utah had been Capitol Reef National Park, a lesser known but spectacular park. From there I entered Colorado stopping first at Mesa Verde National Park. Next, Durango where I camped at Junction Creek, the southern terminus of the Colorado Trail, and after that Little Molas Lake outside of Silverton where I spent two weeks. Ouray, pronounced “your-ray” judging by the way the locals say it, is about 24 miles north of Silverton over Red Mountain Pass along highway 550, also known as the “Million Dollar Highway”. I’m not sure exactly how the snake-like route earned that moniker but the views along this drive are million dollar views and it is a drive not to be missed if you’re ever able to take it. As you might have guessed by my reference to the slithery snake, in places the road twists and turns as it, well, snakes its way through the gorgeous mountainous terrain. It is also narrow with steep drop-offs in places and with no guardrails to block your view–or break your fall–there’s a little added excitement. That said, all manner of vehicles traverse this route including motorhomes towing cars and trailers and a few daringly driven semi-trucks. I was comfortable in my 33′ Class C RV, but you may wish to do your own research to see if you think you’d be alright driving the route. When Ouray came into view my first thought was of Switzerland where little villages are cradled in small alpine valleys. 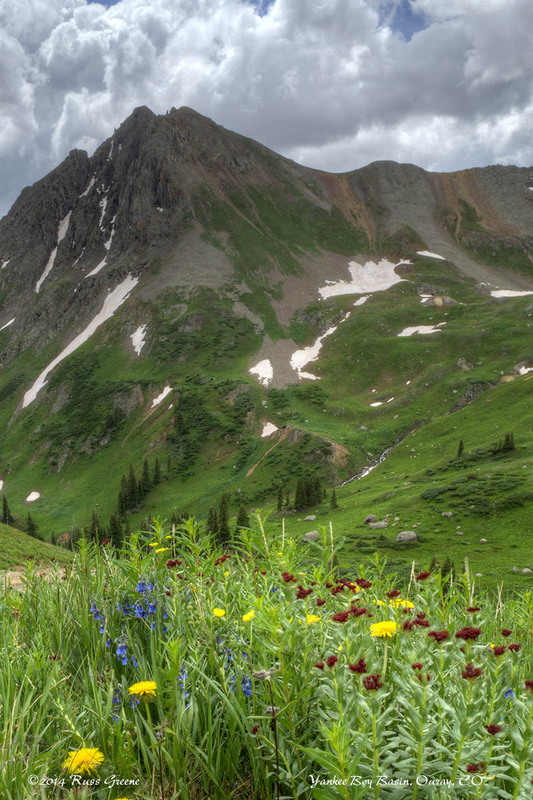 Ouray is like that: a little town surrounded on all sides by towering peaks. The town, in fact, is known as “Switzerland of America”. That’s another moniker the origin of which I’m uncertain, but it seems apt. 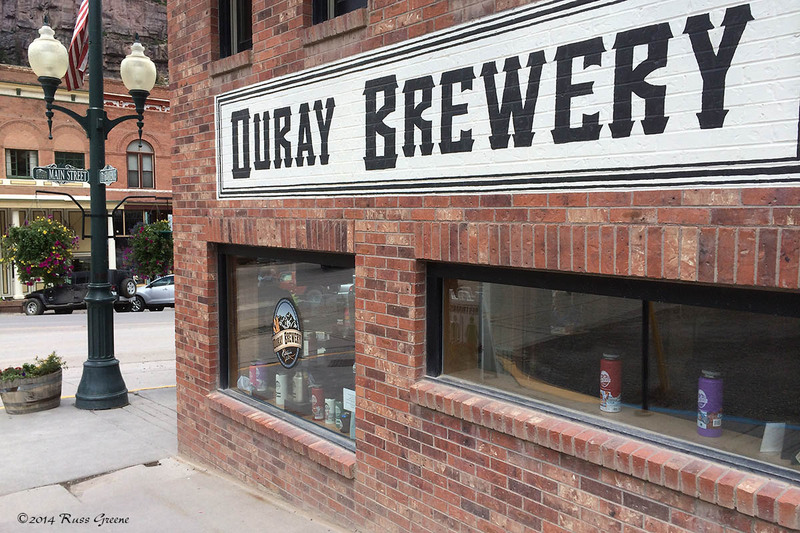 Ouray Brewery, 6th & Main. This view is from 6th. Sometimes when I pass through a place I wonder what it would be like to live there, and why people choose to do so. That brings us to Ouray’s Queen of Beer, Pacie Merling. Now, as to the Queen of Beer moniker, I know where that originated since I coined the phrase myself. 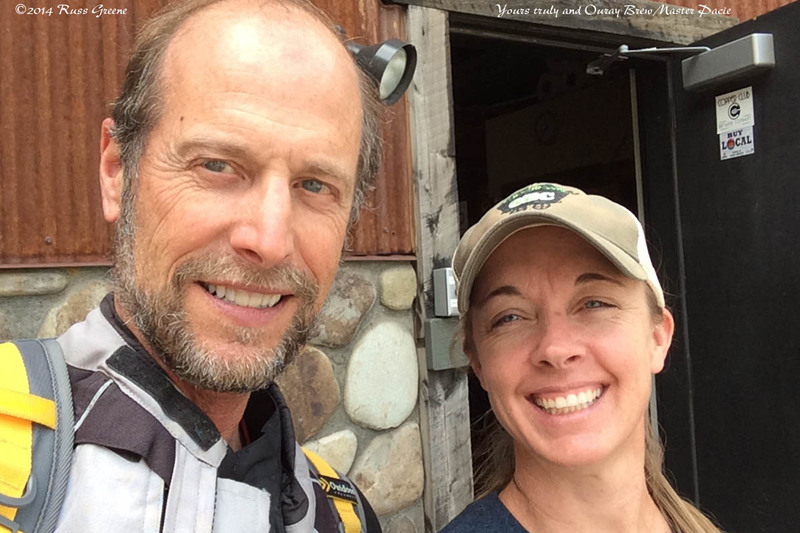 I met Pacie when she waited my table at the Ouray Brewery where I stopped for lunch one day while in town. (I was camped outside of town some 8 miles at Ironton Park.) Her business card shows the title of Manager but that’s a post she has vacated in favor of BrewMaster. Pacie, now 41 and the mother of four, was born and raised in Ouray. She attended college in Tucson, AZ, but returned–with some glee as I understand things–to Ouray, preferring the absence of traffic lights, sirens and police helicopters. So, it seemed to me if I wanted to know what it’s like to live in Ouray and why somebody might choose to live there, Pacie would be a perfect person to ask. Before that, however, I was curious about her name. I’d never heard that name before so I asked about it. As it turns out, the meaning, if any, is shrouded in mystery. It was a name her dad wanted to give her but before he ever said why, 2 months before Pacie’s birth he was killed in a mining accident. I mentioned to Pacie that when I wondered what it might be like to live in Ouray I did a little research on the climate. As it turns out the winters are long and cold, and there is a lot of snow. As Pacie described things, locals work hard in the summers because of the influx of tourists–Ouray a mecca for hiking, climbing, fishing, 4WD-ing–so locals don’t get to enjoy their surroundings as much as they would like that time of year, instead taking advantage of the other seasons when cross country skiing from nearby Red Mountain Pass is popular, as well as climbing in the Ouray Ice Park; Silverton and Telluride are also nearby for people who enjoy downhill skiing. Pacie points out that the countryside is so beautiful and proximate you don’t have to go far to enjoy the outdoor activities. Ouray Brewery. This is where they make the beer, not to be confused with the pub at 6th and Main. Pacie learned the craft of brewing beer on the job and continues to learn as she goes. I was curious how, in a small mountain town, one could learn about brewing… about anything for that matter. According to Pacie, Colorado is home to many fine craft breweries, the BrewMasters accessible by phone when she has a question. She also finds a lot of information online and in books she has delivered. Before interviewing Pacie I tried Ouray Brewery’s 550 Red Ale which I thought was absolutely fabulous, so don’t think that because she is still learning she isn’t also an accomplished BrewMaster. I’m eager to go back and sample the brewery’s other offerings. I was curious about social life in Ouray so I asked Pacie what she knows about that. Pacie, herself in a long-term relationship, explained that most residents of Ouray know most of the other residents. It’s a small town after all, population of about 1,000. There is an established community of families and more-senior residents, but without a college or university or very affordable housing it’s more difficult for younger folks to gain a foothold in order to remain for long in Ouray. It’s tough for young people, she says. Her guess was that although the age range of Ouray residents was pretty balanced there is something of a dearth of 25-30 year-olds. There are cycling and hiking clubs as well as those for other activities that people can join and in which they find social lives. Ouray also has something of a seasonal population, mostly people that come up for the summer. In small town life it’s a good idea to get along with everybody else, even if it’s at times difficult–a point that Pacie raised. Pacie also commented that people in Ouray work hard and long, and that she thought most maintained a good nature even so, happy to be in Ouray. She’d like to see more affordable housing in town. Separately, there’s a lot of creativity going on, says Pacie, citing the Ouray Ice Park and Ouray Brewery as examples. She’d prefer that Ouray not grow in size, not get a traffic light, or see the addition of chain stores. (I wonder how many people know that Ouray has half the population and much less pollution than it did at the height of the mining era in the late 1880s and early 1900s.) We agreed that the opening of a chain store, such as a 7/11 for example, would completely change the character of the town and neither of us favored the idea. 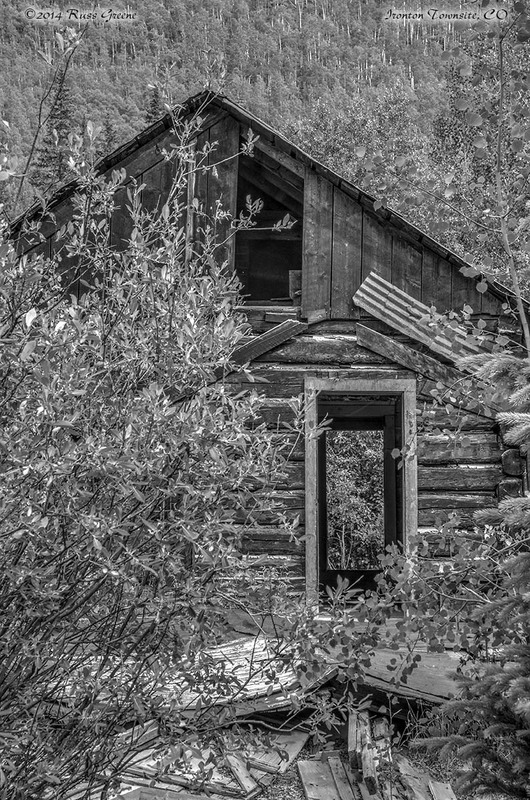 “The thing that’s neat about Ouray” says Pacie, “is that each building, each business, each home is really an expression of what the people are putting into it. It’s not someone else’s idea of what it should be, how it should look, who it should serve… it’s unique”. This, I thought, was a key difference between life Ouray and in larger towns where corporate America’s presence strips the populace to a degree of some important essence of individuality and creative thought. Well said, Pacie. Ouray, like its nearby neighbor Silverton, has but one paved street, the main street in town. Pacie likes it this way and says the dirt roads offer more traction in snowy weather which may help prevent automobile accidents from cars skidding out of control: most all of the streets in Ouray being on a slant. 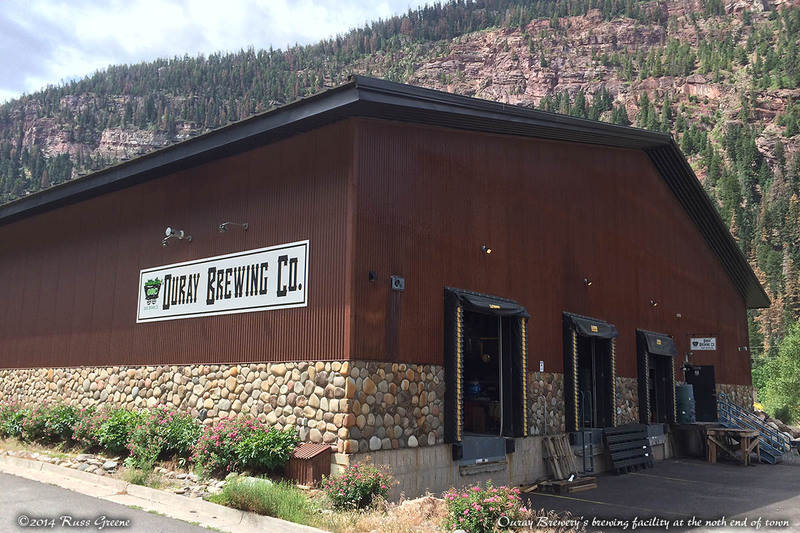 Whether it’s to climb, hike, fish, go 4-wheeling, explore old mining sites, or to sample the ales and beers at the Ouray Brewery, the quaint charm and the spectacular mountain surroundings of Ouray make it a terrific place to put on your list of places to go.